Mudumalai National Park is located at the foothills of the Nilgiri hills in the state of Tamil Nadu. Mudumalai which literally means ancient hills was identified as a reserve way back in 1927 and converted into a sanctuary in 1940. It is a continuation of the Bandipur National Park in the neighbouring state of Karnataka, and is separated by the river Moyar that flows along the border of Tamil Nadu and Karnataka. The park also has a border with the Wayanad Sanctuary in Kerala. Mudumalai is a part of the forest area which includes the Bandipur National Park and Rajiv Gandhi National Park (Nagarhole) in Karnataka, Wayanad Wildlife Sanctuary in Kerala which together constitute the Niligiri Biosphere Reserve. The Mysore - Ooty highway with 36 hairpin bends runs through the thick jungles of the park. On the highway there are chances of sightings of animals like deer, boar and even elephants at odd hours. The 321 sq. km. reserve, one of the most picturesque destinations provides diverse habitats like hills, valleys, ravines, watercourses and swamps. The vegetation comprises of moist deciduous forests, dry deciduous forests and scrub forests which make Mudumalai a most attractive wildlife reserve. Apart from rich fauna, the wide range of animal and bird life has made this sanctuary a hot spot for the wildlife enthusiasts. The temperatures vary between 10 degrees in the winter months to 35 degrees in the summers. The flora in Mudumalai sanctuary include dense groves of Bamboo (Bambusa Arundinacea), thick forests of Natural teak (Tectona Grandis), eucalyptus, blooming trees like Indian Labumusum, Aredesia, Solanancea etc. It has one of the largest populations of elephants in the country, supposedly numbers about 600 and gaur in the region. Another attraction is the giant Malabar squirrel. The other animals found here include Macaque, Common Langur, Tigers, Leopards, Chital, Panther, bonnet macaque, Sloth Bear, Python, Barking Deer, Four Horned Antelope, Otter, Crocodiles (Mugger), Giant Flying Squirrel, Sambar, Hyena, Wild Dog, Wild Boar, Mouse Deer, Spotted Deer, Jackal, Hare, Porcupine, Pangolin the scaly ant eater and Mongoose. The birds spotted in this sanctuary are Peacock, Grey Jungle Fowl, Red Spur Fowl, Grey Partridge Quails, Goggle Eyed Plower, Malabar Whistling Thrush, Large Racket-Tailed Dronge, The Magpie-robin, Spotted Babbler, woodpeckers, Small Green Barbet, Green Pigeons, Brown Dove, Malabar Grey Hornbill, Bulbuls, Mynahs, etc. Among birds of prey, Eagles, Hawks, Buzzards, Harriers, Falcons and King Vulture are predominant, besides some migratory water birds. Morning time trekking is preferable since to watch more bird variety. The wildlife department has a big camp for elephants of 12.2 acres in the Theppakadu ranges of the sanctuary where sick elephants and those captured from poachers / illegal tamers are brought and taken care of. A peculiar weekly pooja (on Friday evening) performed by trained elephants of this camp is a special attraction for the kids. The forest department arranges facilities for wild safari inside the park which enables the visitor to have a look at the flora and fauna. There are mini buses, jeeps and trained elephants available. Elephant safaris last about one hour and is available in the mornings as well as evenings. 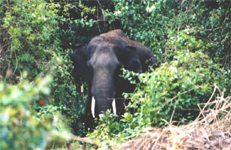 The Safaris can be booked in advance at the Wildlife Warden's office in Ooty or directly at the Tourist Reception Centre. Private vehicles are not allowed inside the park.